Our Prunus Persica Avalon Pride peach tree is more resistant to leaf curl (until one comes along wearing a level 4 bio-hazard suit). The resistance to peach tree leaf curl seems to improve until maturity so some treatment may still be needed until then. It has fruits similar to Santa Claus (large and red) which mature in mid-September and they are excellent eating/slurping/finger licking. We mean mature as in the flesh becomes softer, juicer and sweeter, not suddenly takes responsibility for its actions and volunteers to do some of the house work without being chased. Apparently it was discovered as a seedling in Washington State, now we assume state means location not emotional wreck. Our Avalon Pride produces attractive pink flowers so just be aware of that around blossom time if your gardening ignorant partner presents you with a lovely bouquet. They may score highly in the romance stakes but your fruit yield will suffer! Expect to see large peaches from the Avalon Pride around August time unless you have a neighbour with a warped sense of humour that super glues fruits to your tree. It is supplied as a bush meaning that the first branches of the Peach tree start coming out of the trunk quite low down instead of having a section of clear trunk which gives you a conventional lollipop tree shape. Self-Fertile/Not Self-Fertile: Avalon Pride is a self-fertile peach, therefore it will produce Peach fruits without the need of a second Peach tree nearby. This tree is available on a Semi-Vigorous St Julien Rootstock meaning the tree will reach an ultimate height of 3.6 metres. All our garden Peach fruit trees are carefully nursery grown in pots and containers which means you can PLANT THEM ALL YEAR ROUND. 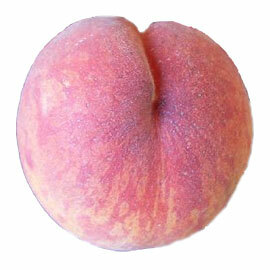 Unfortunately all Peach trees do not winter (Oct-Mar) very well if left outside in their pots. We advise planting Peach fruit trees directly into the soil OR keeping them in a heated conservatory or greenhouse during the winter period if you want to keep them in containers.